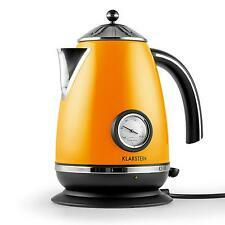 Klarstein Aquavita Chalet Kettle Orange 1.7L 2200W. 2200W power. Classic electric kettle in tea kettle design with 2200W power, 1.7-litre capacity and cool-touch handle. Electric kettle in a classic tea kettle design. Electric orange kettle. Universal plug. Bought but never used as never got around to changing the plug. 1 x Whistling Kettle. Capacity: 3L. Material: Stainless Steel PP. Handle is made of pp material, Annular groove design, can be anti-scald and anti-skid effectively. Height: 10cm/3.94”. Caliber: 8.2cm/3.23”. It is suitable for gas, electric or induction hobs and has easy grip, heat resistant handles. ThisCream 3.5 Litre Capacity Stainless Steel Whistling Kettle byVoche® will add a touch of class to any kitchen. Le Creuset Whistling Kettle 1.6L . Condition is Used. In good condition, has a few marks as shown in pictures but overall in good condition. Please see photographs. Dispatched with Other Courier (3 to 5 days). 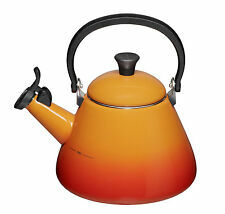 Le Creuset Whistle Kettle 1.6L Volcanic Orange. Condition is Used but in great condition. Used a handful of times. Dispatched with Royal Mail 2nd Class. WALLACE AND GROMIT KETTLE A SCRUFY BOXES. KA27-28, KW, PA20-49, PA60-78, PH17-26, PH30-44, PH49-50, ZE. Model Number 188847. These kettles feature a 1.5ltr capacity, temperature scale, water viewing window, a light indicator during boiling and it includes a spare filter. A matching toaster is also available. 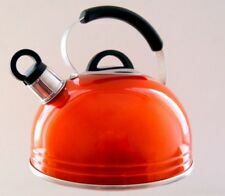 Orange enamel Le Creuset stove top whistling kettle. Excellent condition. See pics. Collect from London N21 or will send via courier. Item as stated. U.K. 240v plug on others! However you may find it already has a 240 v plug on! 1.8L CORDLESS ELECTRIC KETTLE. GM Professional provide excellent after sales service. 1 X 1.8L Kettle with 360 swivel base. 360 SWIVEL BASE, CORDLESS JUG. Electrical Products. GM Professional will provide you excellent experience an outstanding price, service and ethics. All relevant details have been included with the kettle 1.8 cordless Electric kettle.The professional designers from our supplier have designed the kettle to be as user friendly as possible. 1.8 ORANGE KETTLE. The electric, cordless kettle has been made by professionals based in the UK, it has been designed to be comfortable and user friendly. This is noticeable by the shape and position of the handle, which will optimize your comfort when holding the kettle. Classically designed whistling kettle with contemporary twist and push button on the handle. Do not use abrasive cleaners. High quality stainless steel. Simple and easy to use. Light In Weight. Whistling function so you know when it has boiled. Milestone Camping Aluminium Kettle - Orange, 2 Litres. Integrated Folding Bakelite Handle. Ideal for use in camping, fishing & caravans. 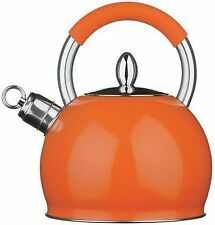 Orange Whistling Kettle - 2.5Ltr - Contemporary look. The classically designed whistling kettle is given a contemporary look with its striking orange finish that will add vibrancy to your kitchen. Made using quality stainless steel, the durable kettle is suitable for all hobs, including induction, making it ideal for all kitchens. 4.5 out of 5 stars - Orange Whistling Kettle - 2.5Ltr - Contemporary look. 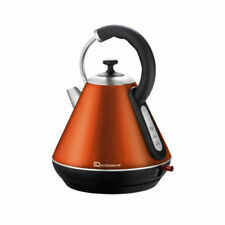 2 product ratings2 product ratings - Orange Whistling Kettle - 2.5Ltr - Contemporary look. Premium Light Blue Electric Cordless 1.8L Kettle 2200W Washable Filter Rapid Boil. And with the ergonomically designed water level indicator window, you’ll be able to see how much water you’re boiling without ever having to open it up or bending it over. 360° Rotational Cordless Kettle. Colour Painted Stainless Steel Kettle. Spare Filter Included In The Box. Safety Locking Lid. Indication Light During Boiling. Boil Dry Cut-off Protection. SQPro Legacy Kettle - 360 kettle view - YouTube. Legacy Kettle. This high quality kettle has been designed by UK based professionals to be as comfortable and user friendly as can be. Cordless Kettle. LEGACY STAINLESS STEEL 360˚ ELECTRIC CORLESS 1.8L PYRAMID JUG KETTLE 2200W. The kettle sits on a removable base that powers the kettle and features an insulated plastic handle and removable lid. 1.80L capacity stainless steel body with a suparb colour finish. 2200W, 1.8L. The professional designers from our supplier have designed the handle shape and position to optimize comfort when holding whilst the kettle swivel base allows the kettle jug to turn 360°, allowing both right and left handed users to use with ease. One kettle. • 360 degree swivel base. Colours Available. This high quality kettle is an absolute must have for those who love coffee, tea or any other hot drink. Have the best tea pouring experience with the wide spout. It has a water level indicator window that allows you to see, with ease, how much water you are boiling. Kettle with whistle. Stovetop Kettle. Whistle: Yes. Capacity: 2L. Scotland – DG, EH, FK, G, KA, KY, ML, PA. Southern Ireland (EIRE). Scottish Highlands, Scottish Isles, Northern Ireland, Isle of Man and Isle of Wright. Colorfull Electric Kettle (1.7L). It's really useful when you make baby formula at night. Legacy Kettle. This high quality kettle has been designed by UK based professionals to be as comfortable and user friendly as can be. Cordless Kettle. Mug Tree and Kitchen Roll Holder. Mug Tree Hold 6 Mugs. Highlander Deluxe Stainless Steel Whistling Kettle. Durable and lightweight whistling kettle. Whistling feature indicates when water is boiling. Manufacturer: Highlander. Colour: Orange. Stainless steel construction. 1.8L Cordless Electric kettle Fast Boil - 2200W. - Premium cordless kettle jug with lid. 1X Premium cordless kettle jug with lid. The high quality design and functionality will allow you to enjoy the ritual of tea brewing. Specialist product architects at our reputable supplier have designed the kettle with auser friendly focus. The handle shape and position are designed to optimizecomfort when holding whilst the kettle swivel base allows the kettle jug to turn360°, allowing bothright and left handed users to use with ease. Add a touch of fun and color to your kitchen with the beautifully designed legacy kettle. A handy touch-handle will not heat up whilst boiling, allowing you to comfortably and safely use the kettle. Legacy Kettle. This high quality kettle has been designed by UK based professionals to be as comfortable and user friendly as can be. Cordless Kettle. 1 x High Quality Cordless, Electronic Kettle. Automatic Shut ON/OFF function. MPN JK39986. 3kW rapid boil. Dual temperature kettle. Simple operation dual temperature switch. double water window. We'll be glad to help. Need Help?. 1.8L CORDLESS ELECTRIC KETTLE. GM Professional provide excellent after sales service. 360 SWIVEL BASE, CORDLESS JUG. 1 X 1.8L Kettle with 360 swivel base. These areas are shown below Electrical Products. A high quality stainless steel whistling kettle for maximum durability. Suitable on all hobs including induction. This great Whistling Kettle can be described as a perfect. Stay cool comfort grip handle with easy open whistling spout.